Paul Dare, legend – officially! The simple philosophy behind Dare Hair’s 25 years as the pre-eminent South Australian salon is that every client is an individual, and no Dare hairstyle ever comes ‘off-the-shelf’. To deliver that perfect balance of individuality, creativity, dazzle and difference, every Dare stylist is trained to perfection in all traditional and cutting-edge techniques - and inspired with the sensitivity, flexibility and keen vision necessary to delight and reassure the wide range of new and regular clients who visit our salon. Stylists trained and experienced at Dare Hair are highly sought after within the industry, and many are award-winners in their own right. Winning the 2008 Australian Hair Legend title, as well as other industry accolades such as the Schwarzkopf prize, is fair recognition for Paul’s 30 years at the top of his profession – but means less to him than the satisfaction of working in the salon each day. Creatively inspired as a young hairdresser by international master-craftsmen Trevor Sorbie and Robert Lobetta, Paul mentors and passes on his skills to the next generation in his salons. Basing his business model on the equally legendary Vidal Sassoon. Paul’s love for his profession has inspired him to create new tools of the trade – the Dare Chisel and Styling Iron – to craft and refine the perfect cut for his most important client – the one sitting in the chair right now. Strange word to find on the website of a leading hair stylist, but education is the key to Paul Dare’s philosophy and the way Dare Hair operate - the key to quality assurance. You just know you’re in safe hands at Dare. Every one of our award-winning stylists has been personally trained by Paul, spending up to 3 years observing and learning the finer details of modern hair care and styling, from the salon floor up. Even experienced stylists who choose to work with us must undergo an advanced training program to ensure they can deliver the high standards of creativity, technique and personalised customer service demanded by Dare clients - and by Paul. 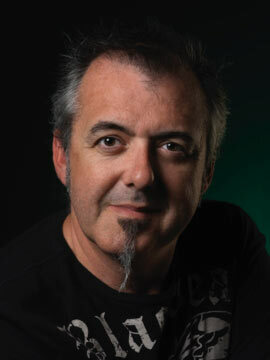 Paul has also been the President and Vice president for the fellowship of Australian Hairdressing. He has been published in British HJ, Harper’s Bazaar and Vogue. Past and present staff trained by Paul are award-winners in their own right.